I am not flying for 2 weeks now, the weather is really bad here. We got some storm called Katia, lot of wind and rain. So no flying outdoors. I had to do some simulator flying, no other option is working in these days. Since I never really used rudder for more than correcting some turns I though that I need to get more advanced in this question. Doing a knifeedge seemed a good point. What does knifeedge mean? 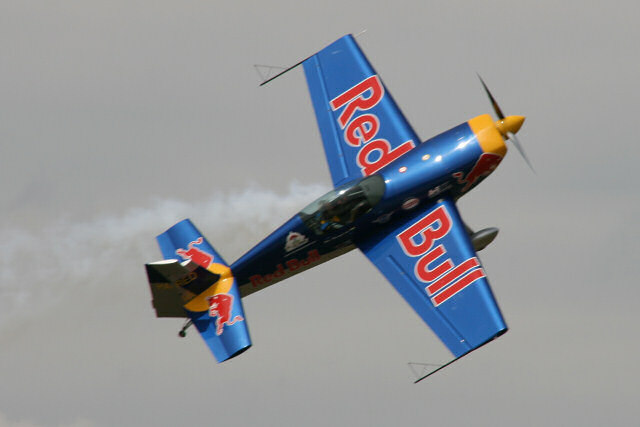 Knife-edge means that the plane flies 90 degrees roll and altitude is held by the rudder. I started to do practice runs in simulator. Crashed maybe 20 times before it started to work for me. You need to compensate for the speed and rudder in order to have proper speed and altitude. And of course holding the plane in 90 degrees roll is important as well. I am having difficulties with weather. When I had time for flying weather was not really cooperating. So I did some simulator practice. I used Rigs of Rods for this, a freeware truck simulator. It uses a method that is similar to FEA calculations, a mesh structure that can bend and distort according to stress load. Very exciting. I hope that weather will get better and I can fly shortly. Update 2011-05-29. Still no good weather. So I made another practice run for you. With some inverted flying. I had two flat type Li-Po batteries for transmitter usage, one is used in my helicopter radio, the other is a spare. Since the Lama v3 radio transmitter that I use for simulator control is without batteries right now (I used them up for the Turnigy 9X v2) I had to mod that radio. Now it features Li-Po as well. Back to the practice, I tried to fly smoothly and after a while I tried to coordinate my turns with rudder while compensating with ailerons. I don’t say that I managed well but tried. I also comment on my pilot errors, you can read my comments during flight. I think I will practice more until next week, when I may do the maiden some day. This is getting exciting! Anyhow I came up with a plan. What if I “fake” my flying in simulator. These modern simulators provide such nice graphics that probably only the eagle-eyed viewers will notice. Please see my flight or my visual story of my flight more likely. This is a short post, since the video tells everything that happened. I learned a lot this time as well, was hoping to be able to do more advanced flying soon. I had a post about RC simulators in general, in this post I would like to show you some of my practice sessions. As I started with helicopters, majority of these practice sessions are related to rotary wing aircrafts. As I progressed I discovered more and more interest in airplane flying as well. Both of them are really fun, so in some occasions you can see airplanes as well. First practice run was already shown in simulator introduction post. For the sake of not missing it I show it again. Then I performed some really lame 3D flight with a Raptor 50 helicopter. It is from Thunder Tiger, great helicopter. Then some other helicopters, mostly 3D loops and rolls. Towards the end I do acrobatic flight with a Giles airplane. Some people build beautiful scale models of this plane. You might notice the level of detail in simulation. When I taxi back to the starting point and the plane is running on the grass the wheel suspension actually flex and the plane rides bumpy. Excellent immersion, great simulator. In following clip I do some 4D acrobatics. 4D ??? Actually with some special motor and propeller tuning you can have special effect in flying. The motor revs at high RPM (fixed) and you control pitch of propeller blades. You can reverse with such planes, since with pitch control the air can be blown in reverse direction. Very special. My last simulator practice video so far covers my nose-in hovering exercise. When nearly crashing into the wall I even created some instant replay effect. Cool, if I might add. As comment I can add that doing simulator training is a great complementary activity. It does not replace real flight, gives some practice without risks. I would like to tell you about simulators, RC simulators in general. Simulators do what the word would imply, they simulate something. By providing a virtual modelling of some behaviour you get practice possibility for some activity that would require a lot of resources otherwise. In case of RC modelling you can simulate your model and practice flying for instance. There are simulators for everything, even for cars. Why is it good? How good can this be? Actually some simulators are so detailed that they provide nearly real-life experience. You have the ability of practicing without jeapordizing your model or your equipment. One important aspect is that you use the controller for the given model, so you can practice doing the same movements as you would fly on the field. With everything you can find different levels here. There are freeware simulators, and commercial products. The most basic that I know of is FMS. It is freeware and very basic. It will give you some experience but I have to admit that using only this software will give you some bad taste in the mouth. The graphics are basic, flight model is basic, the whole experience is very remote. There are much nicer simulators. Like Clearview. Nightflyyer tests it here. Aerofly Pro Deluxe is a very detailed simulator. It needs low resources, this means that you can run it on an older computer. Aerofly 5 is released lately, provides breathtaking graphics and flight model. With some updates version 5.5 gives even more. Realflight is also very good. I am not really used to it, my computer is far too slow for it. The graphics are really detailed, lot of models to choose from. An other important thing to consider is level of realism and how can you convert your simulator practice into real flying. As I understand so far if you are doing something really well in simulator you have to approximately double the difficulty to get what you feel in real life. Let’s take flying helicopter, flying a circle. It sounds easy, however in simulator you cannot really crash. If you do, you just press space and everything is reset. You don’t ruin the model, you just restart. Safe, easy. As there is no risk other than self esteem drops you don’t really get serious with it. When you fly for real you can crash, you can break your precious helicopter, you can even hurt yourself in worse case. So there is much more adrenaline, you are nervous (in a good way), you really get into things. So difficulty will be increased with same manoeuvre. I can show you an example, this is me flying in a simulator. It looks really good and effortless. But don’t get misleaded. I crashed several times, I just scraped those clips and took those that succeeded. So it looks easy but it isn’t. A lot of practice is needed to perform well in simulator. And like two times more to be good in real life. Great fun, I really like how those trails are swept in space. Depending on speed/thrust the colour changes. I added a follow view in the corner, looks fun. I will show you more clips later, how my simulator practice evolved.